All in one Capacity decal Sold by Each for Skeeter Products Model: ZX225. Printed Over White vinyl with Black and Yellow Inks. 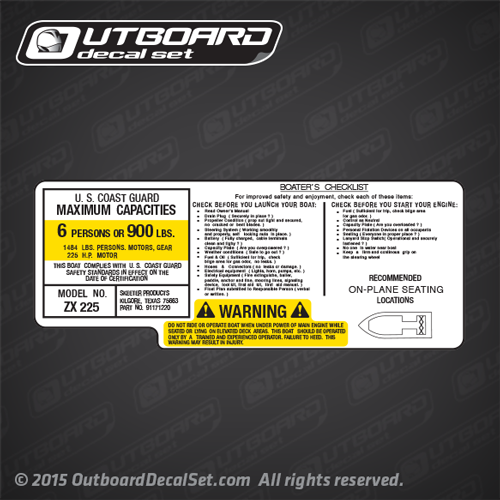 You get (1) All in one Skeeter Capacity Plate decal. 6 PERSON OR 900 LBS. DO NOT RIDE OR OPERATE BOAT WHEN UNDER POWER OF MAIN ENGINE WHILE SEATED OR LYING ON ELEVATED DECK AREAS. THIS BOAT SHOULD BE OPERATED ONLY BY A TRAINED AND EXPERIENCED OPERATOR. FAILURE TO HEED. THIS WARNING MAY RESULT IN INJURY.